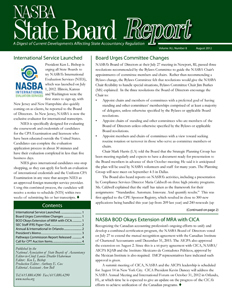 Just as Pathways Commission Chair Bruce K. Behn told the NASBA Regional Meetings in June (see sbr 7/12), the Commission's final report, "Charting a National Strategy for the Next Generation of Accountants," was released on July 31, 2012. Recognizing that the challenges and recommendations made in this report have been discussed in earlier similar studies, the Pathways Commission's "recommendations place significant emphasis on the need for a sustained focus on the many areas that impact accounting education and creating approaches that foster that continuous process." Through implementation activities that are targeted at the report's recommendations, the Commission hopes "that we will be reading about the Pathways efforts 20 to 30 years from now." One of the action items identified by the Commission is: "Convene a task force, led by educators and including broad representation across disciplinary areas and practice, to engage the community in defining the accounting body of knowledge." A broad stakeholder group is to bring together the body of knowledge with competencies keyed to learning experiences in the undergraduate and advanced-degree programs. In Action Item 4.1.3., the report says the Commission's research included review of independent competency frameworks from multiple sources, including NASBA, AICPA, IMA and IIA. The Commission believes: "Whether it is the student seeking educational guidance for a specific career path, a group of faculty developing a new program emphasis, a high school counselor seeking resources to share with advisees, or the regulator seeking to protect the public interest, the body of knowledge and related competency maps will provide relevant and timely information." Melanie G. Thompson, Chair – Business Administration & Economics at Texas Lutheran University, a former member of the Texas State Board of Public Accountancy and a member of the NASBA Education Committee, served as NASBA's representative on one of the Supply Chains to the Pathways Commission.